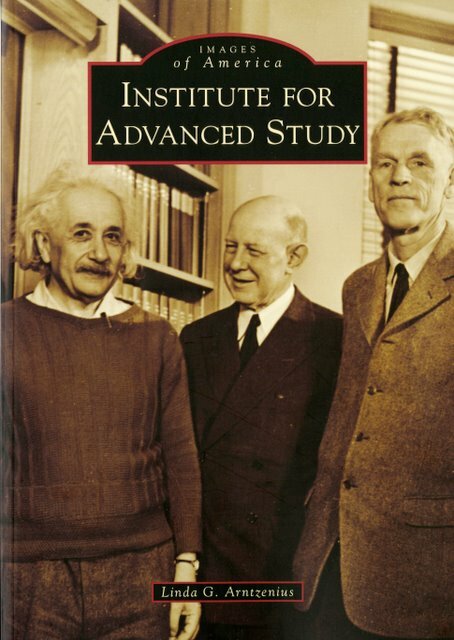 A new "Images of America" book, the Institute for Advanced Study by Linda Arntzenius is now available at the Regulator Bookstore in Princeton. 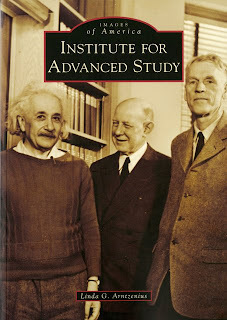 Oswald Veblen (on the right) is included on the cover photo with Einstein. The book includes this text under a photo of the Veblens: "Veblen loved the outdoors and promoted a wooded site in Princeton Township for the institute. The 'wood-chopping professor' would lead groups of IAS members on brush-clearing expeditions in the woods." Since happening upon the Veblen farmstead in March of 2007, I've been puzzling over how to save the famous mathematician's house and cottage. The 14 acre farmstead was added to the county-owned Princeton nature preserve, Herrontown Woods, in 1973 after Elizabeth Veblen died. The house was rented for several decades after that, but all the buildings have been boarded up for more more than ten years now. Given the neglect, it was clear from the beginning that only a strong vision could drive the investment needed to restore the buildings. In the process of exploring options and talking to people about the farmstead, I've met many people intrigued by the houses and the peaceful, wooded site. Veblen Farmstead as key destination: The farmstead is centrally located along a corridor of preserved open space that includes the River Road property, Autumn Hill Reservation, and Herrontown Woods. Efforts are well along to extend this ribbon of preserved greenspace westward all the way to Bunn Drive and beyond. By creating a destination to help draw people out to the area, investment in this centrally located infrastructure will enhance public usage of an extraordinary ribbon of greenspace. Proximity to Smoyer Park: Any activities developed at the farmstead, such as summer camps, would benefit from the proximity not only to hundreds of acres of greenspace but also to the facilities at township-owned Smoyer Park. Developing complementary missions will enhance the usefulness of both facilities to Princeton. Preserving Princeton's Heritage: Two traditions come together at the Veblen Farmstead--the micro-farming that was common in the Herrontown area of eastern Princeton early in the 20th century, and the movement of European intelligencia to Princeton in the 20s and 30s. Einstein was a close friend of Veblen's, and a frequent visitor. The "house in the middle of the woods" is also a European tradition, which Veblen's Scandinavian heritage speaks to. Elizabeth Veblen grew up in Yorkshire, England, and became a central figure in Princeton's social circles. A SUSTAINABILITY CENTER: The first idea was for a sustainability center, incorporating and demonstrating the many home and landscaping practices that come under the broad heading of sustainability. Off-the-grid living, low-maintenance landscaping, demonstrating home energy monitors, utilizing urban timber that currently gets ground into woodchips, fixing slightly broken items for reuse--these are some of the projects that could show how to shift towards lifestyles that will leave a healthy planet in our wake. Relevant to this cause, the phrase "conspicuous consumption" was coined by Veblen's uncle Thorstein in The Theory of the Leisure Class. NATIVE EDIBLE PLANT CENTER: Another concept is for a little demonstration farm dedicated to growing edible plants native to America. Some, like corn, squash, beans and potatoes, have been mainstreamed in our diets. Others, like ground nut and sunchokes, have not as yet. This concept dovetails nicely with the farmstead's location at the edge of a nature preserve, where the proximity of the cultivated native food crops and the wild edibles would replicate an earlier time in agriculture when the distinction between wild and cultivated foods was more blurred. Some of the many edible wild plants growing in Princeton are wild rice, cattail, groundnut and black walnut. MICROFARM: One great thing for kids is to have easy access to farm animals, the chance to see baby animals grow up, and to be able to learn about and help out with some of the tasks involved in raising plants and animals. Related to the first two ideas, a small farm would bring back the tradition of micro-farming that was common in the Herrontown area of eastern Princeton early in the 20th century, the last example of which was the Weller Farm, which became Smoyer Park in 2001. An important element would be community outreach, serving as a location for youth to participate in farming activities, and as a source of knowledge that Princeton residents could put to use on their own "miniature farms", be it a garden or a backyard chicken coop or orchard. Though it's unlikely that much of the farmstead could be cleared for farming, two neighbors who border the farmstead have an interest in farming their properties. One already has chickens; the other grows two head of cattle each summer. The farm would then be a cooperative venture, utilizing the facilities of all three properties, including an existing pond, horse stable and meeting room. PI FARM: This is a fun nickname for a farm for both mind and body, where the intellects of great figures like Einstein and Veblen are celebrated alongside the growing of all the sorts of things that can be served in a pie. Just about anything grown on a farm, be it fruits, vegetables or meats, can end up in a pie, or variations on the pie, like an empanada. Raised beds arranged in the shape of pies will make this farm recognizable from the air. The pi symbol also looks a lot like a house, so alludes as well to shelter and sustainability. The house even appears to have once had pie-shaped windows in the attic. A Pi Farm would explore the relationship between mathematics and various aspects of architecture, carpentry and farming.